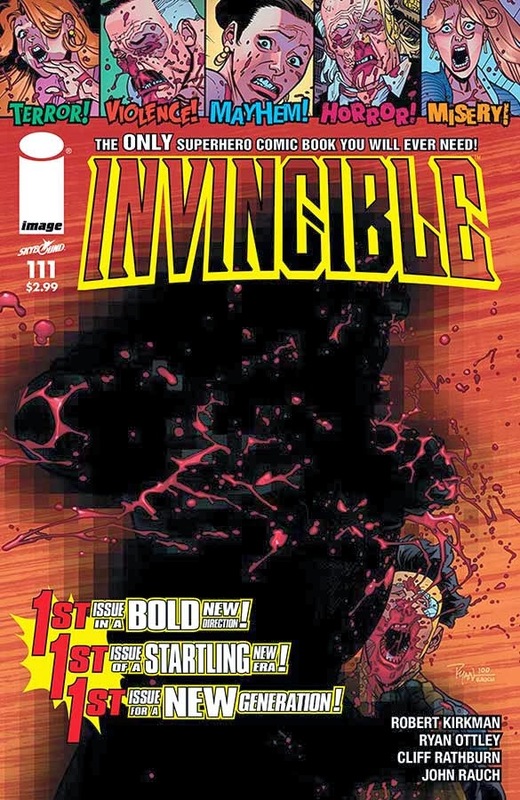 INVINCIBLE #111 is the first issue of a bold new direction, a startling new era, and stories for a new generation from Robert Kirkman, the creator of THE WALKING DEAD empire and up-for-anything artist Ryan Ottley. Suddenly infused with more gore and terror than a zombie apocalypse, INVINCIBLE takes a turn down the dark path of horror when Invincible is betrayed by one of his own. INVINCIBLE #111 packs the punch of three #1 issues combined and is the perfect jumping on point for new readers, that will blow the minds of long-time Invincible fans. INVINCIBLE #111 arrives in stores on 4/16 and will be available for $2.99. INVINCIBLE #111 can be pre-ordered using Diamond Code FEB140476.